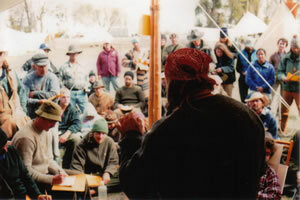 Cody lecturing at Rabbit Stick Rendezvous. 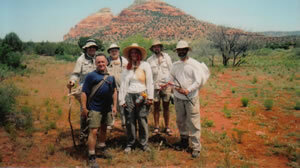 Pausing for a group photo on the trail. One of your classrooms at our school. Using 2 million years of experience to maximize your results in the business world. YOUR COMPANY can be compared to an indigenous tribe. A tribe’s success is directly related to its commitment to the group and the resourcefulness and efficiency of its lifestyle. 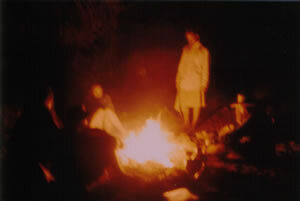 In order for a tribe to survive, members must bring in more supplies than they need. For a tribe to thrive the members must understand the economy of their supplies, and the conservation of their efforts. Against challenges, competition, and often under stress, the tribe must maintain harmony and resolution of purpose. Disharmony can fracture morale and leave the tribe in dire straights. If your company is a tribe, what condition is it in? Are your employees empowered and confident? Are they motivated to succeed? Are you headed for greatness and expansion, or facing extinction? Into the primitive to increase your profits. Your ancestors survived by doing it. So can you! We at ALSS believe the most effective team building involves intimate groups living in the wilderness with limited modern gear. By fully immersing yourself into a challenging, hands-on experience, honest leadership, teamwork and communication emerge, reinforcing the power of cooperation across the board. Using the metaphors of primitive living and survival skills, you’ll reach new levels of performance and productivity, increasing your companies’ operational effectiveness while maintaining sustainable growth. Your renewed awareness will effectively help you squeeze more profit from all areas of your business and personal life. As a result of this experience, you will excel at improvising and adapting to the pressures of a changing business world. Welcome home to the real world - nature. You’ll craft your own gear from nature while living in a beautiful, southwestern wilderness setting. Gourds become water canteens, fire is made from sticks, stones are transformed into cutting edges, and plant fibers are twisted into rope. While pushing your comfort zones you will fulfill group needs as well as challenge your own intellect and emotions! 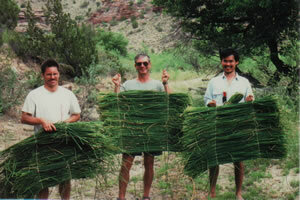 You and your people will succeed with limited resources while living with the land. This is not just another team building experience; it’s a new outlook on life! Nature and outdoor skills are blended with intuitive psychology ensure you a unique, productive experience every time. Metaphor, humor and personal reflection are used to integrate robust course experiences into your hard working business. You’ll develop time-honored, proven strategies to keep your employees creative and motivated as a team. Competition in today’s corporate world is tougher than ever. Let us create a custom adventure for you, today! The most valuable resource a successful company has is the character and commitment of its people. With the right tribe, anything is possible. We are committed toward helping your employees maximize their productivity while renewing their gratitude for and optimism toward life. The ideal time and place, all year-round. Arizona offers you some of the most beautiful lands in the nation. Amazing diversity, from snow-capped mountains to wildflower covered deserts; allow us to conduct a fun, rewarding team adventure for you all year-round. The Aboriginal Living Skills School is a pioneer in offering your company fresh, new team building programs using the real life experience of primitive living and modern outdoor survival skills. Our specifically developed corporate programs are built upon the power of simple skills used the world over for millions of years to maximize gains and increase productivity. Cody Lundin will work closely with you to design the right adventure for your needs, and he instructs all corporate adventures ensuring you a quality experience from start to finish. Don’t settle for less. We’ll help you exceed your company’s long and short-term goals and look forward to serving your organization. Contact our office to brain storm your team building adventure today at (928) 713-1651 or email us at abodude@codylundin.com. © 1991-2019 CODY LUNDIN Aboriginal Living Skills School, LLC P.O. Box 3064 Prescott, Arizona 86302 U.S.A.